I QUIT SMOKING BACK IN JUNE. YAY! I KNOW, GOOD FOR ME. EXCEPT FOR THE FACT THAT I’VE NOW GAINED 10 POUNDS. BOO! SO. 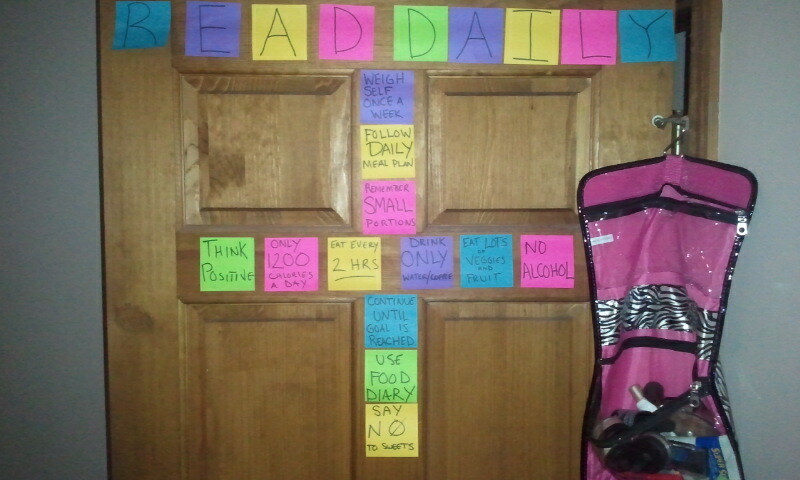 AS A DAILY REMINDER I’VE MADE A STICKY NOTE MONTAGE ON MY BEDROOM DOOR. MY BOYFRIEND LAUGHED AND TOLD ME I WAS CUTE. I FEEL SORTA SILLY ABOUT IT BEING UP THERE, BUT I BELIEVE IN MIND OVER MATTER. AND I REEEAAALLY NEED TO LOSE AT LEAST THE 10 POUNDS I GAINED. IF NOT MORE. Thanks a lot! How are you doing with the not smoking?? Good for you on the quitting smoking! My husband and I quit back in April of 2002. I feel your distress about the weight gain, as that is something I struggle(d) with also. Be vigilant! Oh, stop it. You do NOT need to lose ANY weight! Hooray for giving up that toxic, but be proud of that body!